What if I told you your stock earned you 52%? …and what if that return was earned in 6 hours? That blue arrow is showing you where the artificial intelligence of Trade Ideas (we call her Holly) alerted subscribers to initiate a long position — at $7.10 during the opening 90 minutes of trading this morning. The stock ended up closing the day at $11.10 — a stunning 52% gain from the AI entry and a 72% from yesterday’s close! Not a bad yearly return, in six hours! Now, I’m not going to sit here and tell you that this is an every day occurrence, nor even a regular one. However, as I dig into the data and view chart after daily chart with past AI entries shown, my eyes are being awakened to the power and possibilities that having a machine being my eyes and ears to unearth opportunities in a way that is nearly humanly and physically impossible provides. It is definitely spurring me to dig into developing personal risk management and position sizing algorithms for a trendfollowing strategy aimed at holding stocks for longer and larger swing trades. 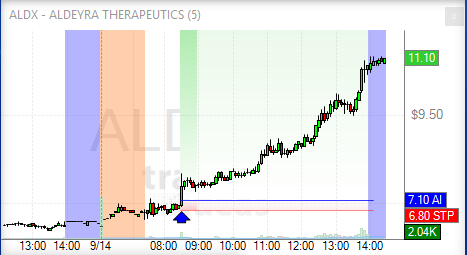 As impressive as a 72% gain is for ALDX, moves like this rarely occur in isolation. And a look at a longer term chart shows that this stock may just be getting started. Do I have a crystal ball and can I predict that? Of course not, but if you made an entry today based on Trade Ideas’ AI signal, a 52% gain since initiation — on day 1 — certainly would give you a comfortable cushion to let this swing trade breath. If you’d like to learn more about Holly, the Trade Ideas Artificial Intelligence engine, head here. And if you choose to subscribe, use Promo Code: CHICAGOSEAN to get 15% your first monthly or annual purchase.